The accusation appeared to catch American military and diplomatic officials off guard, and it remains unclear if it was based on raw intelligence that President Trump had chosen to declassify. The White House warned Syrian President Bashar al-Assad on Monday that he and his military would “pay a heavy price” if it conducted a chemical weapons attack and said the United States had reason to believe such preparations were underway. “If … Mr. Assad conducts another mass murder attack using chemical weapons, he and his military will pay a heavy price,” he said. White House officials did not respond to requests for comment on potential U.S. plans or the intelligence that prompted the statement about Syria’s preparations for an attack. The Syrian government on Tuesday dismissed White House allegations that it was preparing a new chemical weapons attack, as activists reported an airstrike on an Islamic State-run jail in eastern Syria that they said killed more than 40 prisoners. The Britain-based Syrian Observatory for Human Rights said at least 15 militants were also killed in the airstrike that happened on Monday in the Deir El-Zour province. The activist-run Deir Ezzor 24 media outlet said at least 60 civilians were killed. The two groups said the U.S.-led coalition was behind the strike. Russia and Syria also carry out airstrikes in Deir el-Zour, and it was not clear how the activists identified the aircraft responsible. The coalition could not immediately be reached for comment. Ali Haidar, the Syrian minister for national reconciliation, meanwhile dismissed a White House statement Monday that warned Syrian President Bashar Assad’s government against carrying out another chemical attack. Haidar told The Associated Press the charges foreshadowed a new diplomatic campaign against Syria at the U.N. The Kremlin is dismissing the White House’s warning that the Syrian government is preparing a new chemical attack and that President Bashar Assad and his military “will pay a heavy price” if it goes ahead. 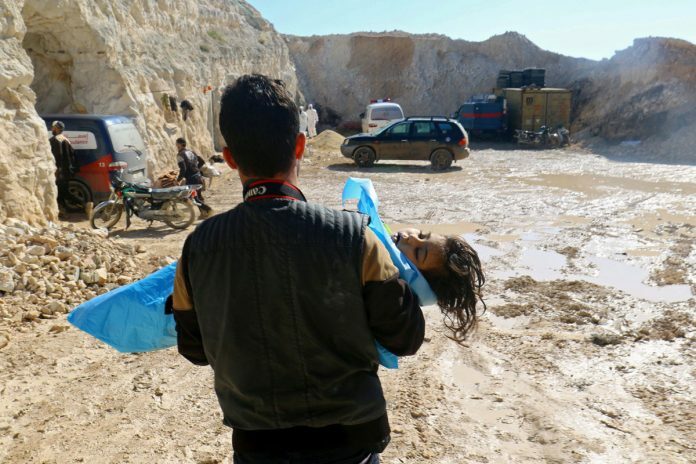 Russia is Assad’s key backer and sided with him when he denied responsibility for a chemical weapons attack that killed dozens of people in Idlib province on April 4. U.S. threatens Syria Over Planning Chemical Weapons Attack. Syria denies allegations of coming chemical attack. Russia slams US warning of Syria attack.